To kick start the fanboy hype of his 2nd and final LP of 2013, Robert Pollard released the first of two singles (the other being a double A side release not reviewed on this site). Tonight's The Rodeo 7'' came out two months prior to the LP, containing the single on Side A and an exclusive b-side. Limited to 500, this 7'' was released on blue wax. Tonight's The Rodeo- Same version as on Blazing Gentlemen. Read the review over there. Astral City Slicker- 3 An unreleased b-side, and a kick in the collector's pants. 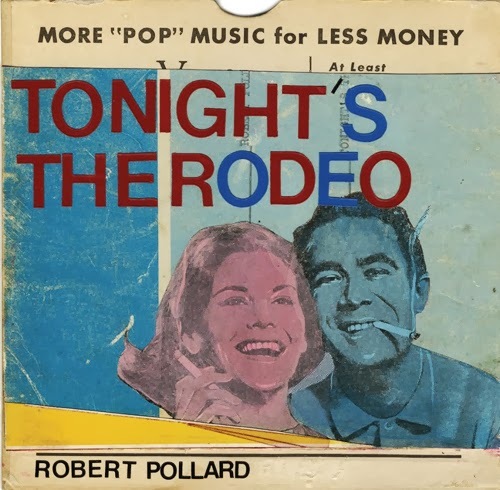 Essentially, this is the full version that contains a section from Pollard's song "Suit Minus the Middle" off of Honey Locust Honky Tonk from summer 2013. A clunky, mildly tone-deaf rocker. Auto-pilot rock for Pollard but far from disposable.